The youngest member of the "Corps of Discovery" was Private George Shannon. Private Shannon is mentioned in several journal entries due to his lack of orientation. On several occasions Private Shannon was sent out into the wilderness and found himself lost. The youngest member of the "Corps of Discovery" was Private George Shannon. Private Shannon is mentioned in several journal entries due to his lack of orientation. On several occasions Private Shannon was sent out into the wilderness and found himself lost. The first time this happened was on August 27th, 1804 near Yankton, South Dakota. While searching for lost horses, Private Shannon became as lost as the horses and did not find his way back to the company until September 11th. During his time on the prairie Private Shannon lived for 12 days on a few wild grapes and a rabbit. It was later discovered that he was traveling ahead of the Corps and after despairing because he could not catch up with them he returned down river towards Saint Louis and eventually found the party. Private Shannon would have other lost-and-found episodes during his travels, most lasted only a few hours, but on August 6th, 1805 Shannon was in trouble again. This time while hunting near Dillon, Montana he didn't find the party until August 9th. Again Shannon thought that the Corps was up river from him. 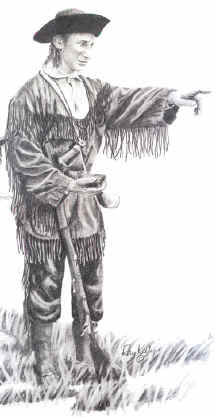 Captain Lewis wrote: "Shannon arrived, and informed us that having missed the party the day on which he set out he had returned the next morning to the place from whence he had set out or first left them and not finding them that they were not above him as the river could not be navigated; he then returned to the forks and had pursued us up this river. He brought the skins of three deer, which he had killed, which he said were in good order. He had lived very plentifully this trip, but looked a good deal worried with his march." Later in life George Shannon studied law and became a lawyer and a senator from Missouri. In 1787 George Shannon was born, a relative to Governor Shannon of Kentucky and of Irish-Protestant descent. During a visit to Pittsburgh he had a chance meeting with Lewis who was patiently waiting for the completion of the keelboat that was to be used on his expedition. Shortly afterwards Shannon enlisted on October 19, 1803 and became one of the ?Nine Young Men from Kentucky? and the youngest member of the expedition. He was selected to be a member of the Permanent Party and was sent to Camp Dubois. In 1807, he was one of the force under Ensign Nathaniel Pryor which attempted to return Sheheke (Big White) to his home among the Mandans. He was elected a member of the Kentucky House of Representatives in 1820 and 1822. He was a State senator from Missouri for a time, then returned to law. He died suddenly in court at Palmyra, Missouri, in 1836, aged forty-nine, and he is buried in an unmarked grave in the Massie Mill Cemetery one mile north of Palmyra.